WASHINGTON — A new fight over the future of the Affordable Care Act burst onto the Capitol Hill agenda on Tuesday morning, as Democrats tried to move past the Mueller report and pounce on the Trump administration’s legal motion to have President Barack Obama’s signature health care law invalidated by the federal courts. 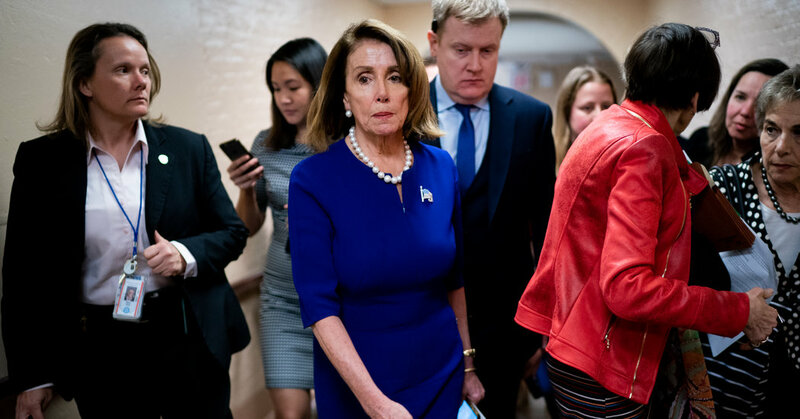 For Democrats, the Justice Department motion to invalidate the health law could not have come at a more opportune time. With the special counsel’s report failing to find collusion between President Trump’s campaign and Russia’s efforts to influence the election, Ms. Pelosi — who was celebrating her birthday on Tuesday — was already pressing to move her party back to the kitchen-table issues that they believe will shape the 2020 campaign. House Republicans — who also campaigned on a pledge to protect people with pre-existing conditions — were far more eager on Tuesday to take an extended victory lap on the Mueller report than field thorny questions about an issue that helped cost them the majority. In its letter to the appeals court, the Justice Department said Monday that it was “not urging that any portion of the district court’s judgment be reversed.” In other words, it agrees with Judge O’Connor’s ruling. “Millions of hardworking families across America could see their health care costs explode because Washington Republicans sided with big insurance companies instead of everyday Americans,” Ms. Bustos added. “They simply cannot say they support protections for people with pre-existing conditions, lowering health care costs, or expanding access to care for more Americans, because they voted to destroy all of these things. In the nine years since it was signed by Mr. Obama, the Affordable Care Act has become embedded in the nation’s health care system. It changed the way Medicare pays doctors, hospitals and other health care providers. It has unleashed a tidal wave of innovation in the delivery of health care. The health insurance industry has invented a new business model selling coverage to anyone who applies, regardless of any pre-existing conditions. The law also includes dozens of provisions that are not as well known and not related to the individual mandate. It requires nutrition labeling and calorie counts on menu items at chain restaurants. It requires certain employers to provide “reasonable break time” and a private space for nursing mothers to pump breast milk. It improved prescription drug coverage for Medicare beneficiaries, and it created a new pathway for the approval of less expensive versions of biologic medicines made from living cells. The government’s position “puts coverage at risk for more than 100 million Americans,” said Matt Eyles, the president and chief executive of America’s Health Insurance Plans, the industry lobbying. The Texas lawsuit “is as dangerous as it is reckless,” Xavier Becerra, the attorney general of California, said Monday as he filed a brief urging the appeals court to uphold the law. How safe are my savings after the financial crisis? September 13, 2018 Comments Off on How safe are my savings after the financial crisis?